In this month’s column in University Affairs, Creso looks at the events following the Ontario government’s cancellation of funding for the Université de l’Ontario français, and how it galvanized the francophone community. Read the full text. Dr. Merli Tamtik, a former member of the research team, has been appointed as an Assistant Professor in the Faculty of Education at the University of Manitoba. She joined the Department of Educational Administration, Foundations and Psychology in January 2016. Merli was a SSHRC Post Doctoral Fellow at York University for the past 2 years. She earned her MA and PhD degrees in Higher Education at OISE. In 2014, Merli received an Ontario Graduate Research Challenge Award from the Ministry of Training, Colleges and Universities for her doctoral research on policy learning in the European Union. The team wishes Merli all the best at Manitoba. Julieta Grieco has been awarded the Ontario Graduate Policy Research Challenge (OGPRC) by the MTCU for her policy brief “Fostering Ontario’s growth in international student mobility: targeting government sponsored international students”. Julieta’s brief draws from her study on Brazil’s Science Without Borders program at the University of Toronto. Julieta provided recommendations for the Ontario government on how to be successful in recruiting International students through targeting participants of Government-sponsored international scholarship programs. The OGPRC targets high-quality graduate student research that is relevant to areas of post-secondary education, training and labour markets of Ontario. Earlier last week, Creso Sá was awarded a research grant under the Ontario Human Capital Research and Innovation Fund (OHCRIF) program of Ontario’s Ministry of Training Colleges and Universities. This project will investigate the current policy environment shaping international student recruitment in Ontario, including an assessment of competing jurisdictions inside and outside Canada. The OHCRIF is intended to support research projects that advance knowledge in higher education, labour and employment policy. Research team member Helen Lasthiotakis has accepted the position of Executive Director, Strategic Partnerships and Office of the Vice-President, Research & Innovation (VPRI) at the University of Toronto, effective September 8, 2015. As Executive Director, Strategic Partnerships and Office of the Vice-President, Research & Innovation, Helen has a leadership role in the oversight of strategic partnerships with external funding and advocacy organizations, coordination of activities with academic divisions and other central portfolios, provide oversight for strategic initiatives, awards and honors, global research partnerships, research information and analysis, preparation of major reports, and the management of the Office. She is a member of the Research Advisory Board. Helen has held previous senior roles at U of T, including Assistant Dean and Director of the Office of the Dean in the Faculty of Arts & Science; Director, Academic Programs & Policy in the Office of the Vice-President and Provost; Science Coordinator for the Canada Ocean Drilling; and Program Manager for the Nortel Institute for Telecommunications in the Faculty of Applied Science & Engineering. She also supported the University’s inaugural Senior Advisor to the President on Science Engagement. A double graduate of the University with a BSc and MSc from the Department of Geology at U of T, she is currently a PhD candidate with the Department of Leadership, Higher & Adult Education at OISE. On June 5, 2015 an article on Canada’s Globe and Mail discussed the Thiel Fellowship, a program that offers highly talented youth $100,000 to leave higher education for a minimum of 2 years and focus on developing their dream start-up. Creso discussed findings of his recent book The Entrepreneurship Movement and the University. On June 1, 2015, Creso Sá presented at the annual conference of the Canadian Society for the Study of Higher Education (CSSHE). After being awarded the Research & Scholarship Award Professor Sá was invited to present on his recent work. The presentation focused on his latest book The Entrepreneurship Movement and The University. The CSSHE is Canada’s forum for the promotion of research in the field of higher education. This year’s conference took place May 31 – June 2 in Ottawa, ON. Team member Daniel Hamlin presented research done in collaboration with Creso Sá at this year’s American Educational Research Association (AERA) Conference that took place April 16-20 in Chicago, Illinois. The presentation entitled “Research Use in Government: The Role of Capacity, Relationships, and Leadership.” examines the use of research in the policymaking process. The AERA Annual Meeting seeks to connect scholars of education, including all levels from early childhood to higher education. With over 2,600 sessions, this year’s meeting welcomed more than 14,000 people. On Wednesday April 15, 2015 team member Andrew Kretz successfully defended his doctoral thesis entitled “Exploring the effects of postsecondary experiences on STEM majors’ attitude towards entrepreneurship.” This thesis was supervised by Creso Sá. The team is very proud of Andrew’s achievement and wishes him the best of luck in his future endeavours! The Canadian Society for the Study of Higher Education (CSSHE) has announced that Creso Sá will be this year’s recipient of the Research & Scholarship Award. This award recognizes a practicing scholar on achievements and contributions to the scholarship on Canadian postsecondary education. 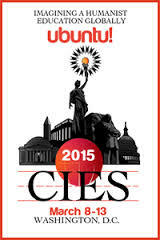 The award will be officially conferred at the 2015 CSSHE Annual Conference taking place May 31 – June 2, in Ottawa. In their newly released book, “The Entrepreneurship Movement and the University,” Creso Sá and Andrew Kretz examine how efforts to support entrepreneurial thinking and practice are impacting higher education in Canada and the United States. The book is the culmination of research undertaken by the research team since 2013, and has been published by Palgrave MacMillan. 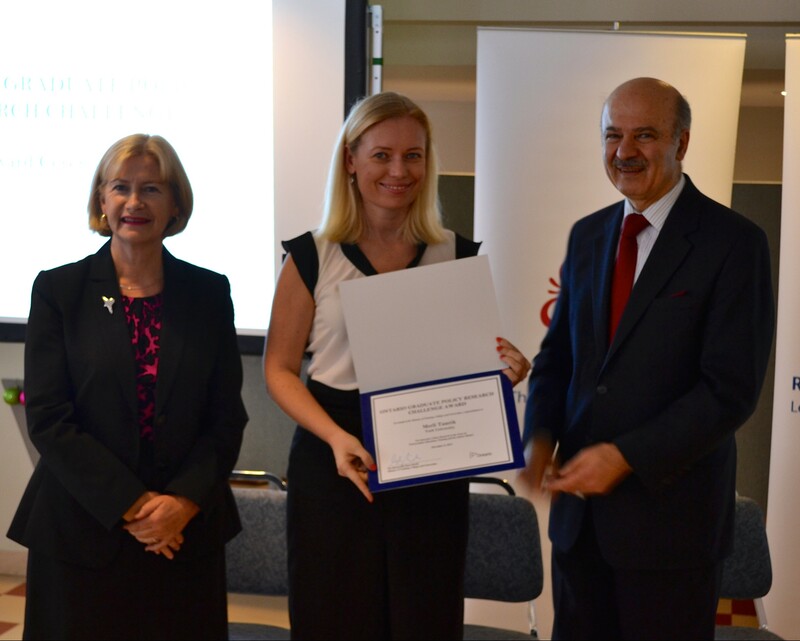 On Monday December 8th, 2014 Dr. Merli Tamtik received an Ontario Graduate Research Challenge Award from the Ministry of Training, Colleges and Universities. She has received the award for her research on policy learning in the European Union during her graduate work at OISE under the supervision of Creso Sá. Congratulations Dr. Tamtik on this outstanding accomplishment! In the picture: Deputy Minister of MTCU Deborah Newman and Minister of MTCU/MRI The Hononorable Reza Moridi.